Crack is not so bad. Forcefully pushing valuable bones in your body until you hear and feel a ‘pop’ sound does not sound too healthy. Unfortunately, I am a knuckle cracker. Honestly, before I began to type I had to crack my knuckles just from the thought of it. I recently made a knew friend who cracks his knuckles even more than I do, which led me to this topic. Advice and common sense tells me that this is probably a terrible habit to continue, but I still do it every day, several times a day. Scientific processes within the body lead to the cracking. Tina Saey refers to the process as cavitation, where as Every Day Health call it tribonucleatioin, but the name is not too important for the sake of this argument. According to Saey and Every Day Health, when you make your bones separate, it makes a space and then you hear the crack. I achieve this by sticking my finger out and pushing it towards my wrist until it cracks. I’ve seen people pull their finger straight out, or curl their finger and push down on the joint. There are many different claims of the long term side effects cracking your knuckles can have. Perhaps the most trivial supposed side effect is enlarging your knuckles leading to an unpleasant appearance of your hands. Allie Firestone references a study that proves this to be true. She says that over time, people who crack their knuckles have a higher chance of having bigger hands. A minor impact cracking knuckles has been proven to have by Jorge Castellanos and David Axelrod is reducing grip strength. A link to the pdf of their full study can be found here . Arthritis is the other claim that is a lot more scary. One study by Kevin DeWeber surveyed people 50-89 years old and did not find a causal link between cracking knuckles and causing arthritis. Unless this result is a false positive, this is great new for me because I can continue to crack my knuckles without fear of it catching up with me later in life in the form of a painful disease. Cracking my knuckles is not as bad as it seems. For some people, cracking knuckles may need to be a habit worth kicking. 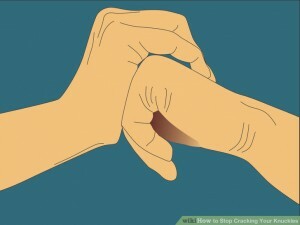 Cracking my knuckles is mentally satisfying, so it is worth the minor risks. Over time, I probably will not even notice if my hands get bigger, and it is not 100% that they will increase in size. I do not think my grip strength needs to be extremely high in everyday life, but of course I would not want to lose it all together. I imagine I will still be able to function perfectly fine with a slightly lower grip strength that I once again, may not even notice. Knuckle cracking is an overall okay habit. First off, I love the title. Its funny and clever. And cracking knuckles I always knew wasn’t good for your body, but I also heard that the results of doing it are exaggerated. All in all, I always did it to be rebellious and because it was very satisfying. I have always been on to crack my knuckles. I do it constantly ever single day. In fact, someone told me when I was younger that knuckles can be “rechecked” every 30 minutes. After being told this, when I was in school I would always crack my hands and look at the clock and then wait the 30 minutes and then crack them again. I haven’t had any problems with cracking my knuckles and I hope it says that way because cracking my knuckles has become a habit of mine. Ive even cracked them while writing this comment. Here is an article that talks a little bit about a study that proves that cracking knuckles is actually good for you. This post may benefit from explaining the mechanism for knuckle popping in order to explain its effects. According to Harvard Health (http://www.health.harvard.edu/pain/does-knuckle-cracking-cause-arthritis), the popping sound that occurs is due to bubbles bursting. This happens in the synovial fluid which is responsible for lubricating the joints as Harvard Health explains. It can then be inferred that lessening the effects of the synovial fluid would be unhealthy for your hands, regardless of whether or not the action causes arthritis. I crack my knuckles and have noticed an increase in finger/hand size! I was wondering whether or not this was correlated for so long. It hasn’t necessarily deformed my appearance enough to make me kick the habit altogether, so I agree that since it is mentally satisfying, it is worth it. I am pleased to know there are no completely negative side effects of doing this.